Since I didn’t cook a turkey on Thanksgiving I decided to cook on the Saturday after. I invited the kids for dinner and planned a simple meal – that’s the good thing about not cooking the dinner on Thanksgiving – you can get away with changing things up a bit. In addition to the turkey and gravy we had mashed potatoes, stuffing, roasted brussels sprouts, mashed turnip & carrots, and bourbon cranberry sauce. And leftover pie for dessert. The house was partially decorated for Christmas by Saturday. I had put away all of the Thanksgiving decor and had put out the Christmas lights and greens but not the snowmen and other Christmas decorations. As Dale was pulling stuff out of the attic he mentioned that I had a box of Christmas crackers up there and I told him that I knew that. I had bought them for Christmas dinner a few years back but we wound up having more people than I thought so I couldn’t use the crackers because I didn’t have enough of them. And then inspiration struck – let’s use them tonight! Everyone’s plate had a Christmas cracker placed on top and when we all sat down we opened them up. The pops made everyone jump, the toys made everyone smile, the bad jokes made everyone groan and the paper crowns made everyone laugh. As much as I love to be Swedish at Christmas, I’m actually more English than Swedish and it was really fun to embrace this English tradition with my family. 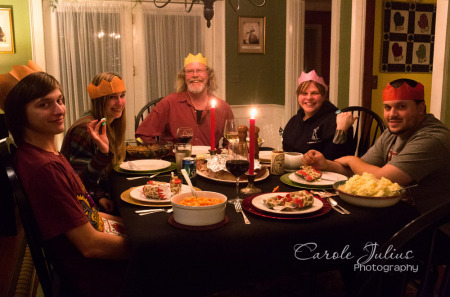 And you know, say what you want about the English being stuffy but any group of people that can sit around the Christmas dinner table wearing paper crowns has got to be more fun than you might think. I have to say, while it feels odd not to have Thanksgiving with our family, this Saturday-After-Thanksgiving bit has an awful lot going for it. A little creativity and flexibility around the holidays always makes for the most fun gatherings!!! It looks like y’all found a great way to celebrate! What fun! Looks like a perfect family gathering. Changing things up is always a lot more fun! You dinner sounds like a great time! Your family looks quite happy and fetching in their crowns; Thanksmas looks like it was a rousing success! More celebrating is always better. I like the idea of Christmas crackers! What fun! We ended up doing two Thanksgivings ourselves to accommodate everyone this year. A little hectic but it was nice to spend time together. And recycling the desserts was great because now I can’t eat them! Ahem….that’s as fancy a menu as I ever produce. Sounds like it was a great dinner! And yes, I love crackers, too. Googeling…. Good proof of the adage that we’re all kids at heart! Thanksmas is gonna be the new thing 🙂 …any excuse to get the whole family together for a homecooked meal is a blessing this time of year. and of course, paper crowns #ftw!